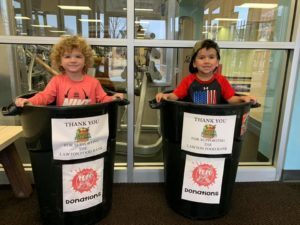 Donations bins are at local businesses. Final collection is at Country Mart West on March 9. 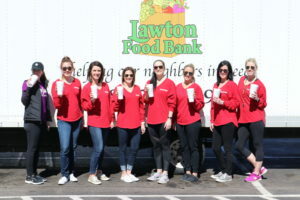 Elizabeth Fabrega, Tiffany Davis, Whitney Kochenower, Ashley Towe, Laura Ross, Jenny Sheperd, Ashley Taylor, and Caroline Fox pose with the food bank truck in 2019. Sarah Woods starts the final day of 2019 Food Fight by soliciting food donations! Whitney Kochenower, Jenny Sheperd, Caroline Fox, and Laura Ross organize food donations in 2019. 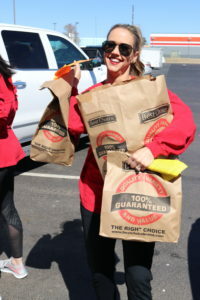 Jenny Sheperd carries neighborhood bags of food items in 2019. Ashley Towe collects donations from Country Mart patrons in 2019. Tiffany Davis, Ashley Taylor and Laura Ross divide food items between bins in 2019. Food Fight is our food donation drive benefitting the Lawton Food Bank and hosted by the Junior League of Lawton. 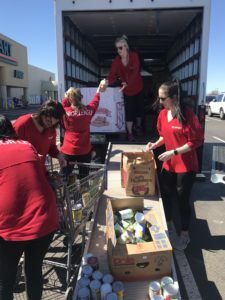 The Junior League of Lawton competes annually against other Oklahoma and Texas Junior Leagues to raise the most food for local food banks. In 2019, Junior League was able to collect more than 4,700 pounds of food items and more than 8,000 pounds equivalent in monetary donations! In 2016, JLL collected more than 2,200 pounds of food items for the Lawton Food Bank. In 2017, JLL collected more than 3,000 pounds. In 2018, JLL collected more than 3,400 pounds. 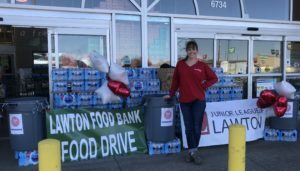 In 2019, JLL had a goal to collect more than 3,500 pounds to benefit the Lawton Food Bank. The following local businesses are helping as donation sites! Stop by today to donate. The Lawton Food Bank requests kid-friendly foods. Examples are below. The YMCA is an easy drop site for adults and kids alike. 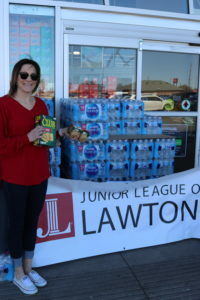 You can donate funding to Junior League to benefit the Lawton Food Bank below.